We weren’t as close to starting the Saab as I thought. There wasn’t much left to put back together. All we had to do was put the pump in the tank and the tank in the car, hook up the lines and wires, pour some fuel in, and start it up, right? Wrong. Once the tank was back in, I poured a few gallons of fresh fuel in while my brother installed the pump. We slid some new O-rings onto the pressure and return elbows and pushed them into the hat. But they wouldn’t seat all the way. They were tight, but way too tight, way too soon. Something was hanging up. So we yanked them back out to check for interference, but only one popped out unscathed. The elbow for the pressure line broke, leaving the plastic tip tightly wedged inside. So we pulled the pump back out to take this fight over to the workbench. After much cutting, prying, and drilling, I managed to spin the last bit of the old check valve elbow out. My brother ordered up some new elbow valves (only needing one, but fearful of the other breaking) and I took some measurements. Finally got the tip of the old valve unstuck from the hat bore. The bores for the valve elbows were smaller than those on the old fuel hat. Not like “the next size down” smaller, but more like an error in manufacturing tolerances. It wasn’t a different size for a different application; it was built wrong at the factory. Close, very close, but just far enough to cause a fitment issue. I double-checked the new valve elbows, which were of the same aftermarket brand as the pump. The tip of the valve was the same size as the originals, but the barbed end was a different size, needing an adapter to connect to the fuel line. What a pain! Anyway, back to the pump assembly. The new valves would not fit in the bores of the new pump assembly. I could feel the plastic starting to wedge into place, whereas on the old hat’s bores, only the O-rings gave resistance (for sealing). 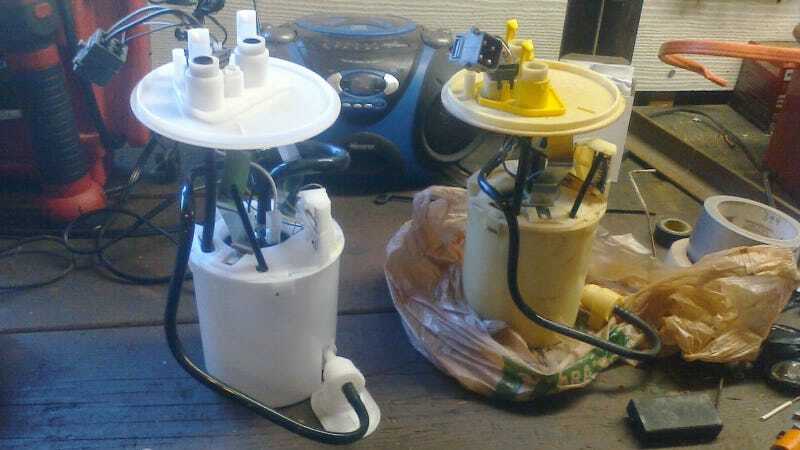 This was of course an aftermarket pump assembly, attractively priced at around $100, as opposed to the $300+ it would have taken to get an OEM Saab or Walbro unit. Despite all this frustration, we decided that it was still worth avoiding spending that extra coin. And we didn’t want to go through the hassle and delay of arranging for an exchange with the vendor, so we decided to stitch part of the old pump assembly onto the new. Also note the orientation of the plumbing between the two pump assemblies. There’s plenty of flex in the new one to make it work, but the old pump’s tubing is tucked up closer to the body. The new one takes some maneuvering to get right. That meant frankensteining the hat and wiring from the old pump assembly, and attaching it to the new pump, basket, and plumbing. After replacing some tubing and clamping it tightly with ear clamps, we had ourselves a pump that could actually be plugged into the car. We primed it and sent some fuel towards the engine. But alas, several cranking attempts would not start the car under its own power. It would still respond to ether, but not fresh gas. Damn, I thought we had this in the bag. The tank is clean, the pump is new, the lines are clear, the filter is new, the injectors are clean and their solenoids work... we never did check that fuel pressure regulator, though. And wouldn’t you know, even though the pump delivers fuel towards the engine, nothing is coming back through the return line. Hmm... So we’re thinking that maybe the regulator is clogged with the same ugly mess that we found in the tank. OR... maybe this cheap Taiwanese pump isn’t all it’s cracked up to be (wouldn’t surprise me, based on what I’ve seen so far). Maybe it’s not generating enough pressure for the regulator to relieve? But maybe there’s more to it than just fuel pressure. We pulled the spark plugs, and found that they were all dry. But the injectors DO work- we tested and cleaned all four of them. Are they... not getting power? Know What You&apos;re Doing: a Saab Story.